Scuba divers are used to sharing the ocean not only with its natural inhabitants—everything from fish and sharks to corals and crabs—but also with another breed of divers: freedivers. Most scuba divers have seen them gracefully ascending and descending without breathing, swimming so close to curious marine animals that it provokes a feeling of jealousy. If you have not tried freediving yourself, you must be curious about this mysterious and seemingly extreme sport. How do they do it? What’s it like to dive without a scuba tank? Here is a brief introduction to freediving for scuba divers and others who would like to know more about this fast-growing sport. Just about anyone who has swum in the ocean or even in a pool has most likely tried freediving. Defined broadly, freediving is swimming underwater while holding your breath. That means that anytime you dip below the surface, submerging your face and body while holding your breath, technically you are freediving. But freediving is more than that. 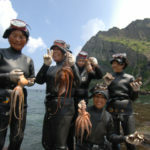 It is also a unique way to explore the ocean unencumbered. 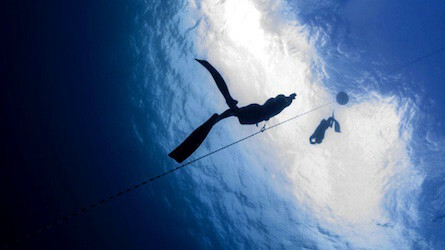 Recreational and professional freedivers learn and practice breath-holding techniques that allow them to hold their breath for long periods of time and dive to depths beyond what is possible for recreational scuba divers. While both scuba diving and freediving have many similarities—both get you wet, both make your ears pop and both involve some element of danger and exploration—there are some major differences. First, while scuba divers tend to dive for exploration and to observe aquatic life, freedivers have an additional set of goals. Often competitive, they may strive for the deepest depth or to outdo their longest dive time. 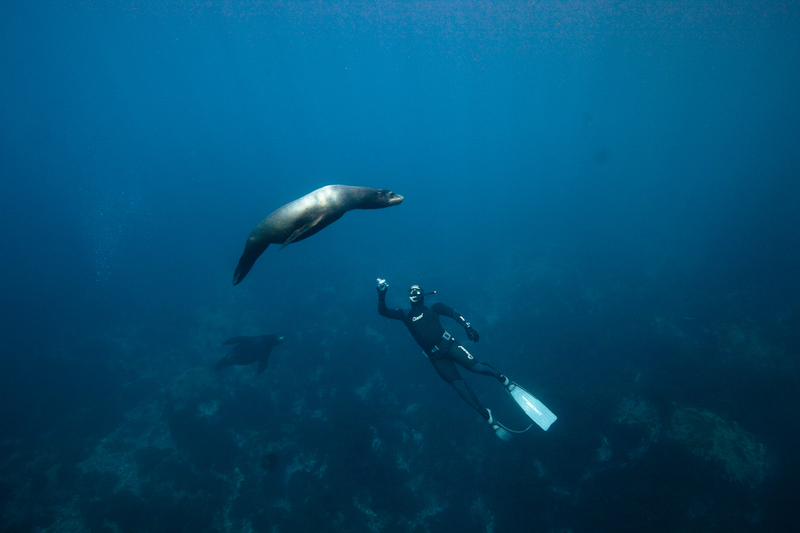 And while freedivers equally enjoy swimming with and observing marine life, they may also just glide into the depth for a feeling of supreme calm and relaxation. Second, freedivers use very little gear. An elegant wetsuit (if any), a low-volume mask and snorkel, and slender fins take the place of bulky BCDs, clunky tanks and dangling tools. Because they are so streamlined and don’t blow bubbles, freedivers tend to blend in with their environment, allowing them to have much more natural interactions with marine animals. As world class freediver William Winram puts it, “scuba diving is like driving a 4-miles-a-gallon truck, where you have all the luxury of being wasteful.” Freediving forces you to be much more focused and deliberate with your movements. 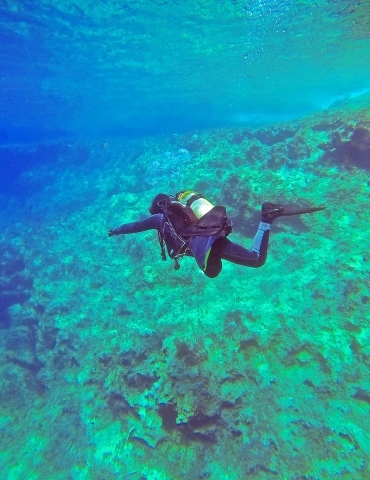 Third, most freedivers need not worry about lung over-expansion or decompression illness, two major health issues that scuba divers are warned against from the beginning of their certification course. As a result, freedivers can ascend and descend as quickly as they please, without concerning themselves with a safe ascent rate, no-decompression limits or making safety stops. Finally, the ultimate difference is that freediving is an exploration of the body and mind. To be a successful freediver, one must train the mind to achieve a deep state of relaxation and calmness to use the least amount of oxygen as possible and to overcome the urge to breathe at depth. The time a freediver spends diving, while shorter than on scuba, can be much more intense. This is because freedivers rely only on their own skill to prolong their time and depth and not breathing apparatus. 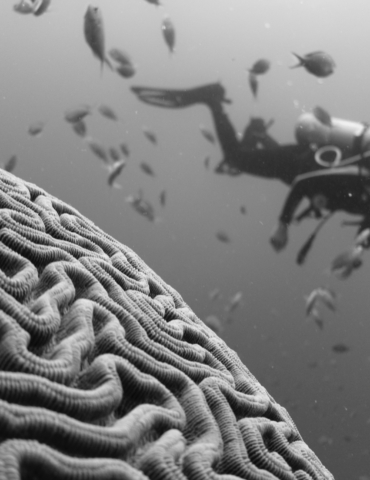 Many argue that training to be a freediver will make you a better scuba diver by teaching you greater physical and mental control over your body and mind. 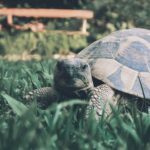 The advanced equalization and breathing techniques you learn will help you with your air consumption. In many ways, freediving is more challenging than recreational diving and, arguably more exhilarating. One of the most interesting things about freediving is what happens to the human body when it dives. 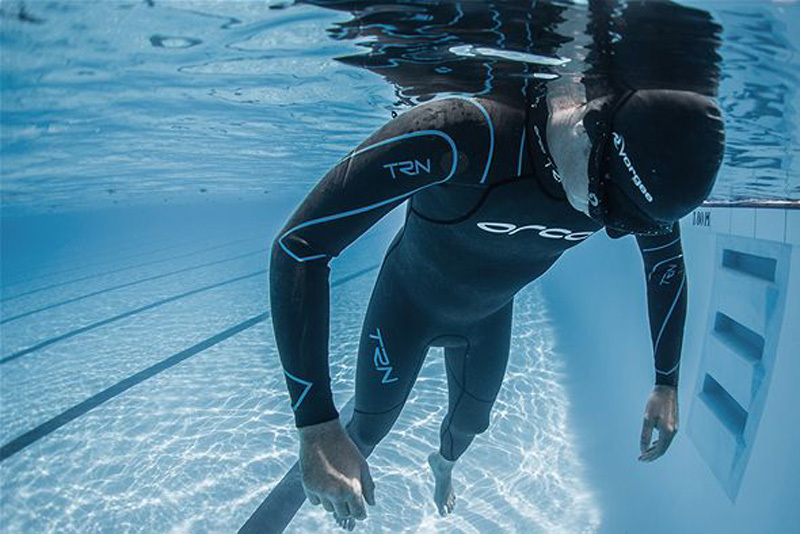 At first, with lungs full of air, the freediver is positively buoyant and must swim hard to gain depth. After about 10 meters (33 feet), the pressure on the body doubles, compressing the lungs to half their original size, and causing the diver to become neutrally buoyant. 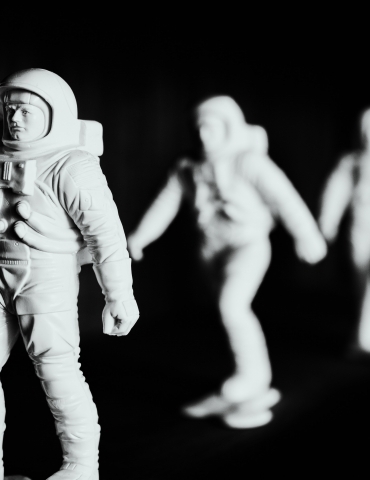 A feeling of weightlessness sets in. As they continue diving the process reverses itself and sink phase, or freefall, begins. At this point, the diver’s body becomes negatively buoyant and is pulled down towards the depths. It may not seem natural to hold your breath for any period, but it needn’t be. Enter the Mammalian Dive Reflex, a physiological response that slows your heart rate and diverts the blood flow from your extremities to your vital organs, allowing you to last longer on what little oxygen you have. As a bonus, the increased blood flow to your lungs will prevent them from collapsing under the pressure at depth. 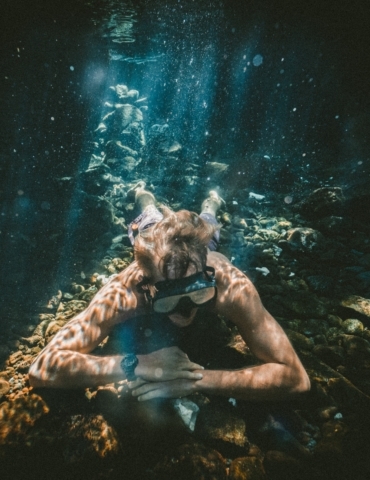 The body enters a state of relaxation, like deep meditation, and it is this state that freedivers often describe as feeling one with the ocean. The rush of adrenaline when resurfacing after a long dive can make freedivers beam with euphoria. People have been freediving for different purposes for centuries. People from ancient cultures would dive for food, tradeable items such as pearls, or to salvage goods lost at sea. Spear fishers past and present freedive so that they can get close to and sneak up on their prey. The same goes for underwater photographers. 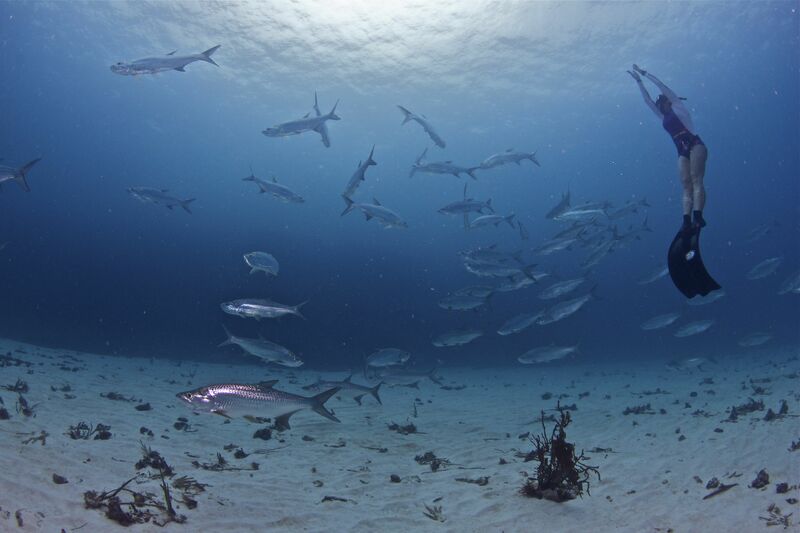 While freediving, photographers can navigate extremely close to their subjects without scaring them away with loud breathing or distracting bubbles. Only recently has freediving evolved into a recreational pursuit. While it still exists on the fringes of mainstream sport, freediving as a competitive sport is starting to gain popularity. Ever since the first international competition took place in the mid-1990s, world records have been broken every year since. In competitive freediving, there are several different categories, each with their own disciplines. Records can be set in each individual discipline, but most national and international competitions require divers to participate in multiple disciplines with a cumulative score tallied at the end. Pool disciplines take place in the controlled environment of a swimming pool. The two main pool disciplines are static apnea and dynamic apnea. Static apnea is a timed breath-hold discipline where divers hold their breath for as long as they can without swimming or moving. Dynamic apnea is a competition for distance as opposed to time, where divers see how far they can swim on a single breath. Dynamic apnea can be done with or without fins. Assisted depth disciplines involve variable weight and no-limits categories. In variable weight, the diver uses weight to descend, leaving them on the bottom and ascending again on a line. In no-limits, the diver can use any means possible to descend and ascend. Usually, a weighted sled will be used to descend while a lift bag and a line help the diver ascend again. There is no denying that freediving is a dangerous sport. One magazine calls it the second most dangerous sport next to base jumping. While most deaths occur outside of official competitions, blackouts are a common occurrence at freediving competitions, as daredivers hold their breath for longer and dive deeper than their bodies can handle. Blackouts are so common at competitions Winram says, “there are only two types of freedivers: those who have blacked out and those who will.” Internal bleeding caused by a pressure ‘squeeze’ can also affect freedivers. 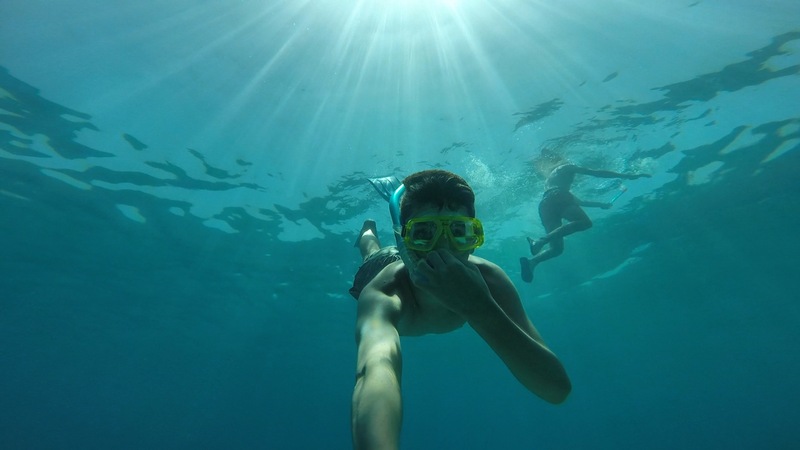 But just like with scuba diving, the risks of freediving can be minimized with proper training, by following safety guidelines, and by diving within your own limits. At competitions, numerous safety measures are in place, to recover divers who do not surface when they are supposed to or who require medical attention after surfacing. For scuba divers who love the ocean and enjoy a challenge, giving freediving a try seems like a natural transition. The sport will give you a new perspective of the underwater world and will help to improve your underwater skills. You can get started by talking to your local scuba diving or freediving school. Certification courses are widely available, offered by AIDA, CMAS, PADI, SSI, FII and PFI. A beginner course will teach you about the risks of freediving, basic breath-hold and equalization techniques, how to rescue a fellow freediver in trouble, and how to dive deeper than you ever though you could.